We'll be opening on Friday, June 21! We have many ways to plan and enjoy your Epic Discovery Experience! Heavenly's Zip Tours are a tremendous activity for all levels of explorers and groups. These guided tours show off the world class views and environment as your group glides effortlessly through the sky. There are options for everyone! Discover free activities for all ages! 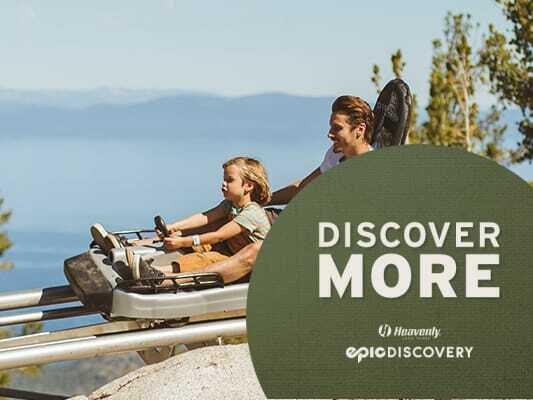 Stop by the Epic Discovery Welcome Center for the insider scoop on all activities and adventures. After that, get out and walk one of Heavenly’s unrivaled scenic hiking trails or find the other fun, free activities. We’ve teamed up with The Nature Conservancy to create eco-discovery experiences at Heavenly to promote education and awareness of our unique environment. Interpretive Discovery Stations are integrated along trails and activities, and we offer guided hiking and 4x4 tours with knowledgeable and passionate guides.